EPSON Print CD for Windows 10 - a tool for creating images on CDs. The application supports the import of raster files, uses an extensive library of fonts and various elements, allows you to generate covers using a dummy layout. 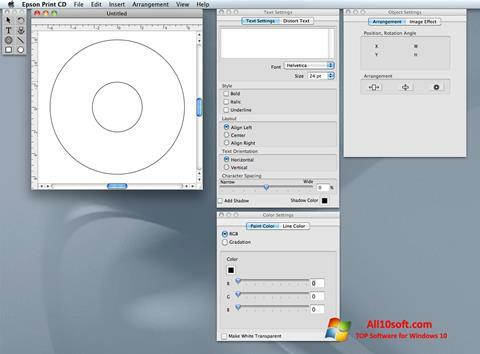 The functionality of the utility includes tools for blurring images, adding circular text, special characters and symbols, contains a set of various text effects, basic drawing tools, cropping and moving project objects. The program has a simplified user interface and can work without integration into the operating system. You can free download EPSON Print CD official latest version for Windows 10 in English.